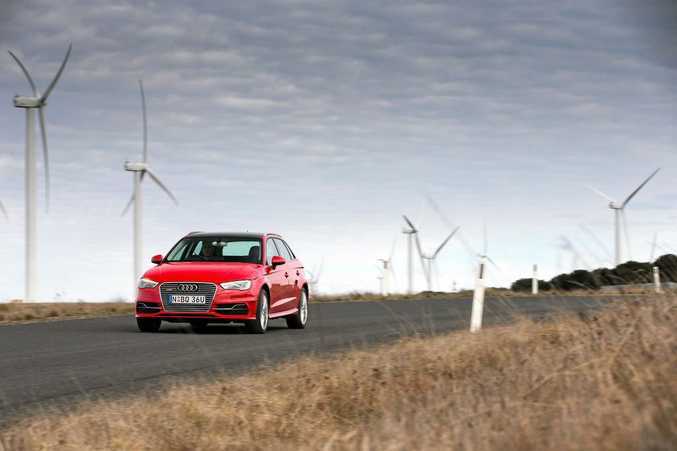 ON A CHARGE: Audi A3 Sportback e-tron has a quoted economy figure of 1.6-litres/100km, but you gotta pay to be green: at $62,490 it costs more than the rather less eco-friendly S3. HYBRID cars tend to force you to search your conscience. They are great, of course, for the environment but why do they have to compromise so much on looks? 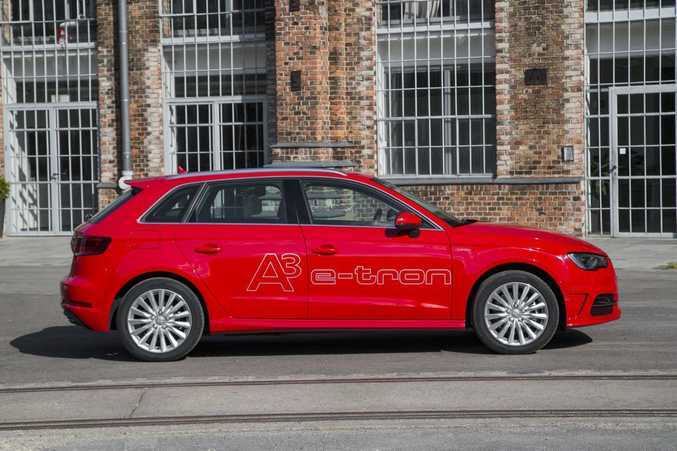 The A3 e-tron, Audi's small car plug-in hybrid, is a rare combination of style, efficiency and comfort. The exceptional electric power is ably supported by a more than competent petrol engine for a range of over 900km, meaning you get the best of both worlds. It is targeted at those living in or close to the city travelling less than 50km each day and offers an electrifying package of sportiness and sophistication. Aside from a couple of Eco gauges and dials and, of course, different trip computer settings, the interior of the e-tron is pretty much like the rest of the A3 range - understated elegance. Space is generous, the leather trimmed seats are super comfy and there are plenty of nifty storage options for those travelling both near and far. Actually, space is compromised a little with the lithium battery pack under the back seat, forcing the petrol tank - which itself loses some capacity - to impinge on the boot, making it 100 litres smaller than the car on which it is based. As nice as it is, it feels like a car boasting this much remarkable technology should have an interior that is a little demonstrative of that fact, a little bit of standout styling. The lack of noise on start-up is pretty much the only indication you are driving a car with electric power at its heart. 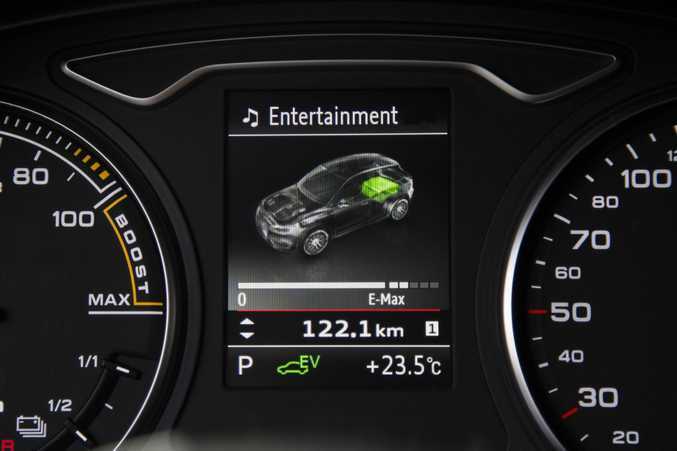 This Audi e-tron uses the talents of 75kW/330Nm electric complemented by the same 1.4-litre four-cylinder petrol engine found in the regular A3 for a combined system output of a very useful 150kW and 350Nm. You have the choice of running on EV only, petrol only or a combination of the two to suit driving conditions. The battery has an approximate range of 50km - enough for an average commute - but that is often easily extended by the energy harnessed through braking. The petrol engine cuts in automatically, and seamlessly we might add, when the battery power runs out and it can charge up your pack while in use too. The e-tron is some 300kg heavier than the A3 but drives beautifully offering a balanced, dynamic ride with quick turn-in and excellent handling. 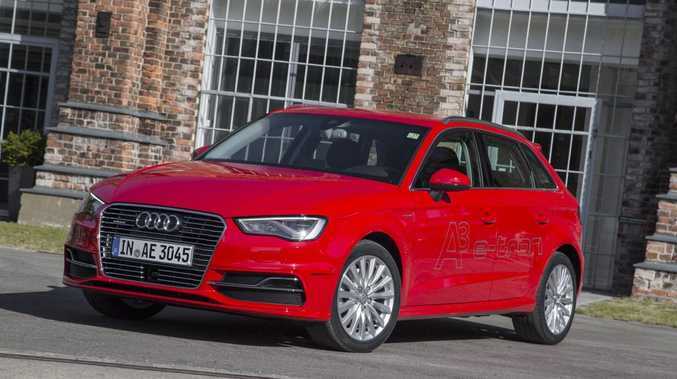 Audi certainly hasn't eased off the pedal with creature comforts with the A3 e-tron equipped with sat-nav and reverse camera, park assist with front and rear parking sensors, leather sports seats, digital radio and LED headlights to name just a few. of optional packages that added electric heated seats, metallic paint and a number of safety features. It comes at a price though; more than $67,500 with all the fancy extras. This is one of the key factors when considering a car of this type. Audi suggests 1.6l/100km is about average for the e-tron with our week in the car yielding about double that figure. 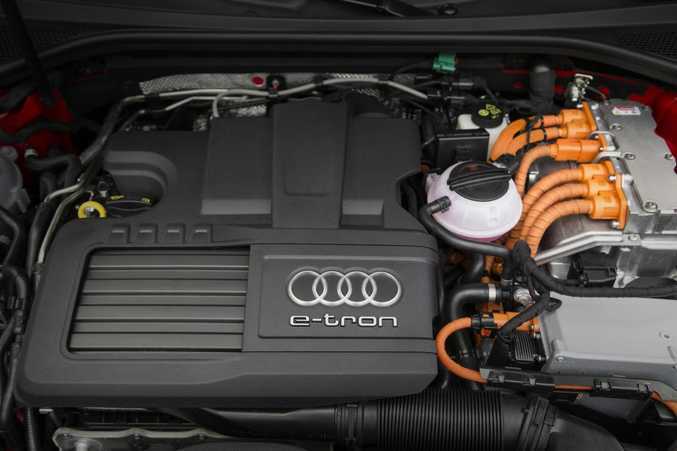 You can plug the e-tron in for five hours to charge in your garage or Audi will install a special station at your home as part of the package which cuts that time to little under half. The cost of the charge depends on the time of day and tariff and can range from $1.01 - $4.78. There is not much to choose from in this segment just yet with interest also shown in the BMW i3 (from $63,900), Lexus CT 200h (from $37,990), Toyota Prius (from $34,490) and Nissan Leaf (from $39,990). Many people want to drive a green car that doesn't shout from the rafters and the Audi e-tron does this while offering on-trend technology and comfort. It drives beautifully and can carry the kiddies with no worry too and makes sense over both short and long distances. It is pricey though, very much so. There is discretion in the exterior changes too with a subtle e-tron badge and body kit, new 17-inch alloy wheels and concealed exhaust pipes. 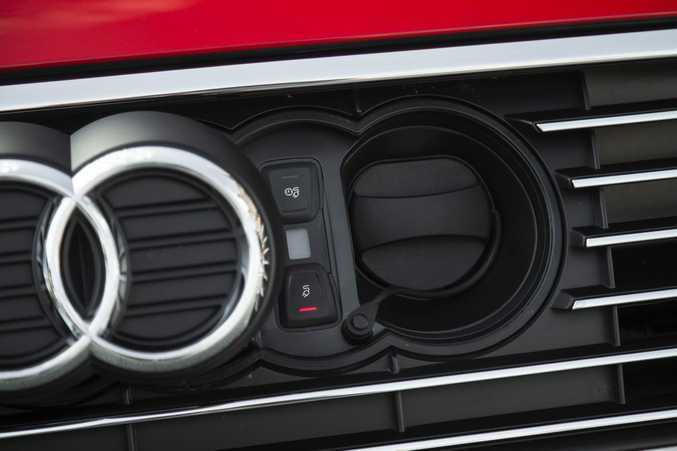 The charge plugs in to the grille with Audi's four-ring badge sliding across to accommodate it. This Audi e-tron is packaged as the perfect bridge builder, a car that is good enough to impress while the boffins work out how to extend a battery pack. 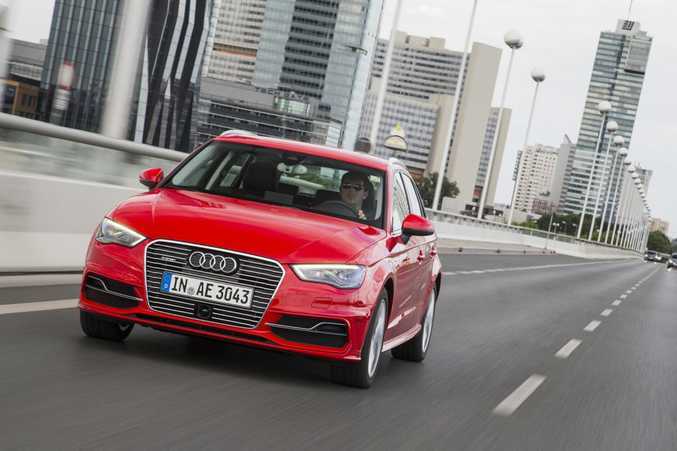 Economically - it costs more than the Audi S3 - it makes little sense, but is great for the conscience and offers driving pleasure to boot. Details: Five-door front-wheel-drive plug-in hybrid hatch.